Ned Yelovich and Kimberly Clarke find themselves on opposite ends of Hurricane Florence's expected wrath. Yelovich, a Freemansburg native who taught for 30 years in the Bethlehem Area School District and coached soccer at several Lehigh Valley schools, and Clarke, a 1975 Moravian Academy graduate, aren't going anywhere. 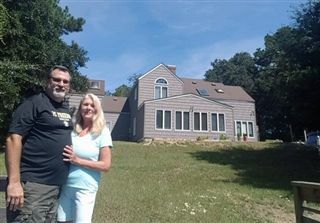 Two days ago, Yelovich, 58, and his wife Karen, who have lived the past two years in Southern Shores on the Outer Banks of North Carolina, went to stay with a relative farther south in a low-lying area on Emerald Isle, he said. When a mandatory evacuation was ordered there, Yelovich figured he and his wife, who is a Liberty High school graduate, would be safer at home two blocks from the Atlantic Ocean, but more than 250 miles north of the Wilmington area which was among Florence's potential targets. "We were leaving," the retiree said of their plans before the side trip. "We were ready to leave. We were going to head up to Pennsylvania." Waves out from Florence were 83 feet high on Wednesday and 20 to 40 inches of rain are expected wherever it hits land, the National Hurricane Center said. Hurricane-force winds were extending 70 miles from the eye. The three-bedroom, two-bath saltbox house where the Yeloviches moved is up on a dune, about 50 feet above the canal. It is sealed up. They moved "a bunch of furniture." But as Florence's path came into focus, the Yeloviches decided to ride it out. "We're very confident," Yelovich said on the 84-degree morning that was filled with sunshine, calling it "absolutely beautiful." "We might get tropical storm weather. We had storms in July that were that bad with 5 or 6 inches of rain." There is a mandatory evacuation in place for the Outer Banks, which are in a hurricane warning, but "they can't make you go," Yelovich said. "... I'm not worried about water or storm surge or flooding" due to their raised location on the east side of Route 12 in the first municipality north of the Wright Memorial Bridge that connects to the main land. His neighborhood, which features old growth oak trees, reminds him on the area of the Poconos where his dad had a cabin. "It looks like Pennsylvania," outside of the sea grass and sand, he said. Although they don't have a generator, they have stocked up with a week's worth of food. And that's a good thing, because both nearby grocery stores have closed, although two gas stations remained on on Wednesday morning. About "90 percent" of the residents have left, meaning there won't be "too much traffic" if the Yeloviches have to run for it. "If it does turn this way, we have an escape route," he said. So far, there's no closure planned for the bridge, which is a mile or two away, he said. The TV was on and the region has a channel with good local weather updates, he said. "We're good," he said. "We appreciate everybody thinking about us up north." This would be Yelovich's first hurricane in his new home and he only has one thing which which to compare it. "Hey, we've dealt with blizzards up north," he said. "We've been without power up north. I know there's a considerable difference. ... We're ready." "Living in Pottstown was a snow thing," she said Wednesday morning from the grocery store where she works in South Carolina. "I lived in Rhode Island for the Blizzard of '78." She's been in Charleston for more than 25 years, missing Hurricane Hugo in 1989, but her parents were there for that, she said. She did pull up stakes for Hurricane Matthew in 2016, she added. "But he was nothing compared to this," she said via Facebook Messenger. "Florence looks like another Hugo. (Hurricane) Floyd (in 1999) was the only other one worth mentioning and that was a logistical nightmare." Now Interstate 26 can be reversed so traffic can flow in one direction to efficiently get away from the shore, she said. "You can get out but not in," she said. But she doesn't expect to go far from home this time even though Florence has developed an unexpected tendency to head south once it arrives near week's end at the North Carolina coast, about 200 miles from Charleston. "I am one of the stubborn ones who usually chooses to stay and pray," she said. "I will do the prep of clearing front and back porches. Take things off walls and put collectibles in the middle of beds. Fill the gas tank." She lives 10 minutes from Folly Beach and being that close to the ocean she'll likely "hunker down with family on the other side of town." She still has time to change her mind, she figured. "If Florence makes a turn for us, tomorrow morning would be 'go time'," she said. The customers at the grocery store "are pretty sane," she said. They were clearing the shelves of water, bread, batteries and canned goods, Clarke said. The local Walmart had already shut until the weekend, she added. There are certainly parts of hurricanes of which she wants no part. And Florence could still be a hurricane if it comes as far south as Charleston, officials said. "The scariest parts are the water and the toll it takes on your psyche with serious winds," Clarke explained. Charleston Mayor John Tecklenburg told the Post and Courier newspaper that "It's gonna be a lousy weekend here," advising people to get out of town. Police Chief Luther Reynolds added, "We are a resilient community. We are going to recover from whatever comes ... but, the safest thing to protect human life is to evacuate now." But that hasn't chased off Clarke. "I do not think we will take a direct hit, but certainly will be involved," the graduate of the Bethlehem Township prep school said. "From what I can tell, she will put a big hurt on a lot of people."